Coat vegetable oil in a pan over low heat. Add minced garlic and minced ginger to pan and stir-fry until fragrant. 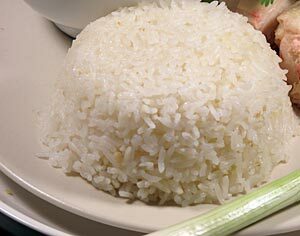 Add uncooked rice to pan and stir-fry until rice is glossy and fragrant (3–4 minutes). Turn off pan and move contents into rice cooker. Strain chicken broth into rice cooker. Start rice cooker and serve when finished.